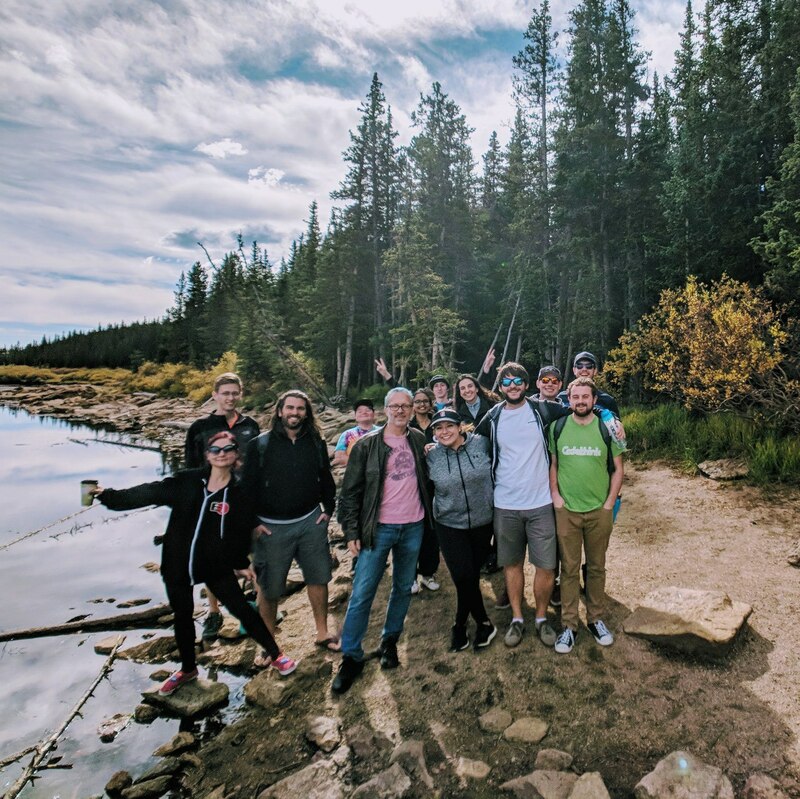 Last year, I proposed that the GNOME Foundation Board and employees have a hackfest in order to build out a more strategic and expansive budget, and in order to work on initiatives like restructuring board and committee relationships. We found the hackfest to be really useful, so decided to have another hackfest this year at the beginning of our fiscal year. This year’s hackfest was held in Cambridge, UK because four out of the nine people attending lived in the UK, and two lived in Cambridge. As with last year, we met for three days, from October 17th to October 19th. Collabora kindly allowed us to use one of their beautiful conference rooms for our hackfest, and Kat helped make sure that we were well-fed and felt at home there. 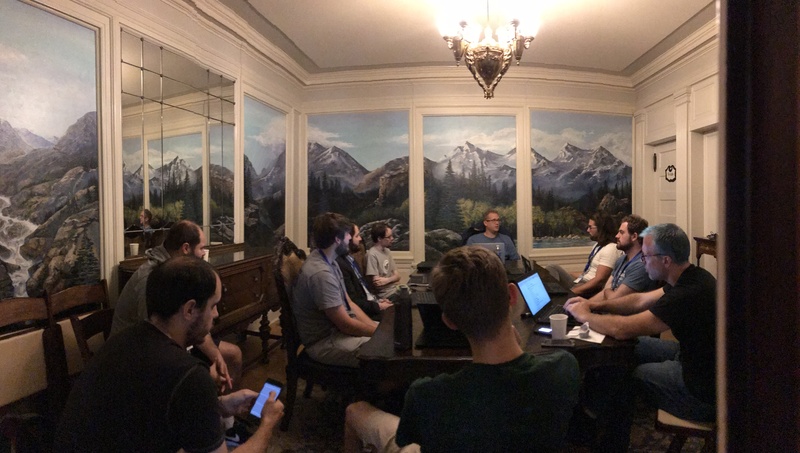 While we were at the hackfest, Robert McQueen posted about what we worked on and accomplished, and I highly encourage you to check it out: Foundation Hackfest 2018 – By Rob McQueen. In this post, I won’t repeat what he said, but instead will talk about a few of the things I spent time hacking on. One of the things that I’m personally eager to improve at GNOME is diversity in all its forms, and I think that changing the travel policy can help us do this. This may not seem like the most intuitive thing right off the bat (how does our travel policy affect diversity within GNOME? 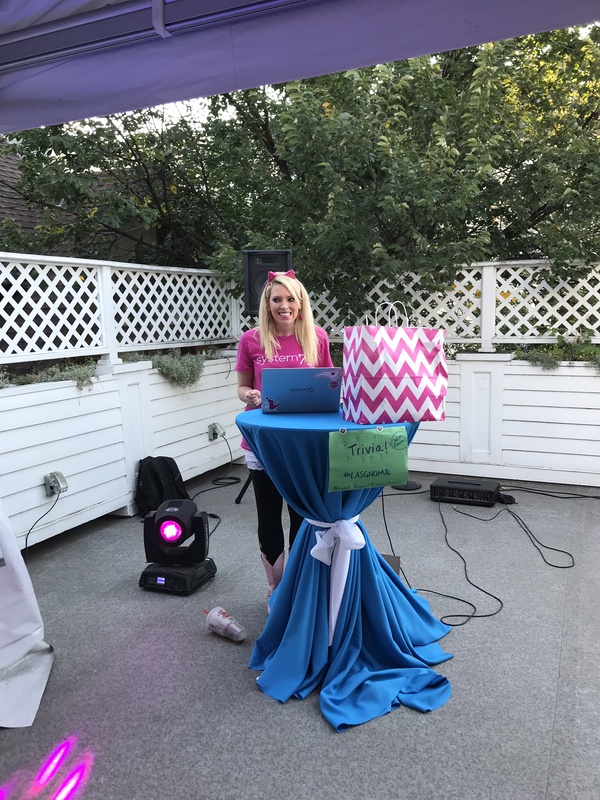 ), but in-person events are incredibly powerful as a vehicle for motivating current contributors and connecting the dots on a newcomer’s journey to contribute more regularly. I myself am an example of how someone who was lurking on a mailing list became an active contributor after their first GUADEC. If we see events as catalysts for contributions (both conferences and hackfests alike), it makes sense that our travel policy can be used to affect who contributes to the project, and by extension, affects the diversity of our project. Funding people who normally can’t afford to go to events brings more voices to the table. Unfortunately, covering just flight and hotel is not enough for some people (food away from home and transportation can be prohibitively expensive!). How can we better support community members who have the most need of financial assistance? Most of GNOME’s hackfests and conferences are in Europe and the US, and perhaps as a result, most of GNOME’s core contributors are based in Europe and the US. How can we use the travel policy to encourage more geographic diversity within GNOME’s core contributor base? Right now the travel policy makes it seem like only Foundation Members can apply for travel sponsorship so newcomers often don’t feel like they are allowed to apply (in truth, anyone can apply but Foundation members and speakers get preference). How can we use the travel policy to encourage more newcomers like creatives, project managers, user testing experts, and underrepresented groups in free software (including racial, gender, etc) to attend events and start contributing? Sure, there’s a lot more to achieving diversity than just changing the travel policy, but it’s a start. It’s also something that only the board has the power to change, and it’s a fundamental part of our infrastructure that can support our community’s growth. So, I was excited to work on this while at the Foundation Hackfest this year. So how far are we in making the changes? The tl;dr (Too Long; Didn’t Read) version is that Philip Chimento and I are still working on a final proposal that the board can approve. We can’t guarantee any changes to the current travel policy since the board hasn’t approved an official update yet. However, it’s my most sincere hope that we can update the travel policy in a way that will support diversity at GNOME and foster more growth and innovation for the Project . The Engagement Committee was set up as the budget holder for the Engagement budget, which is split into two buckets: marketing and small events. This year, we decided to allocate $6K USD for marketing and $3K USD for small events. Marketing costs are things like stickers and SWAG, or stocking and shipping the Events Box that allows community members to set up GNOME booths across Europe at various conferences and events. Small events are things like release parties, social events at hackfests, GNOME meetups, newcomers workshops, etc. As a plug, if you’re interested in putting on a small event, check out this handy wiki page for tips and resources: GNOME-Related Events. The process for requesting funds from the Engagement Committee needs drastic improvement and promotion, and we need to fix a few other things before we can call this new way of handling Engagement budget requests a success. However, I feel excited about the direction that this is heading since we went from a time when we barely had an Engagement team or budget (when I first joined), to now having Engagement hold more importance within the budget, and by extension, within the GNOME Project. Unfortunately, I wasn’t able to take many photos of the Foundation Hackfest this year because Collabora has a strict policy around photographs in the office. Here are a few pictures from our time getting around Cambridge, and from the punting adventure that Neil, Rosanna, Matthias and I had on the day after the hackfest ended. 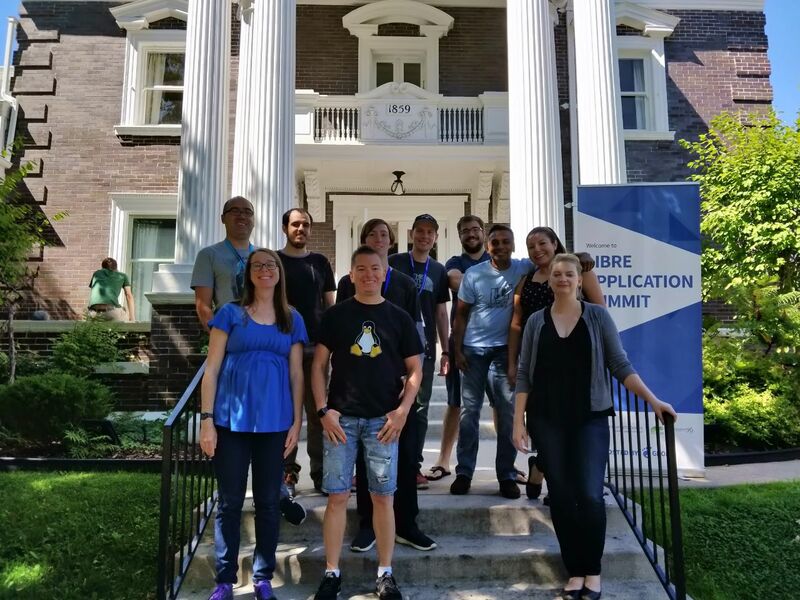 This year was the second time GNOME has organized the Libre Application Summit, and this year I participated again as a volunteer. The conference was held in Denver, Colorado, at the Parkside Mansion. The venue is typically a wedding venue, but it was cozy and had the right amount of space for a small conference. 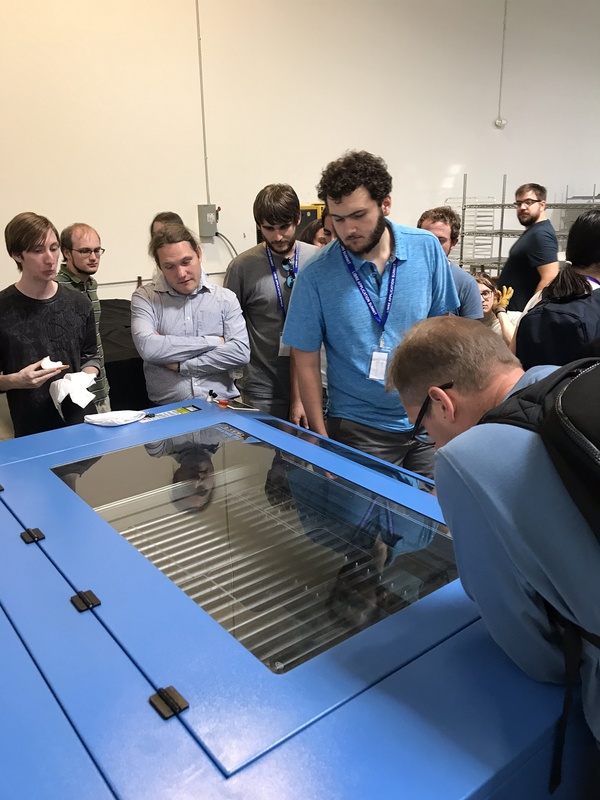 It gave attendees a chance to participate in the talks and then break out into smaller sessions and BoFs on the last day since it had many small rooms to pop into. 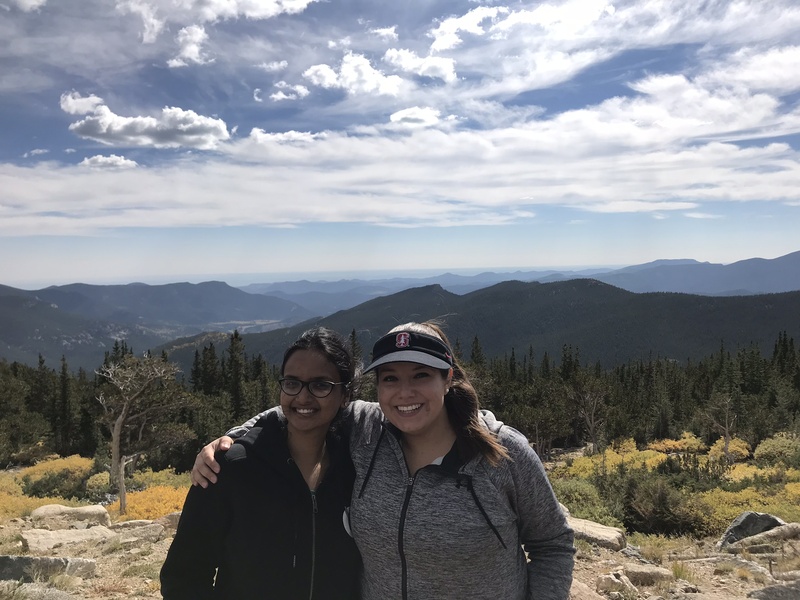 Since I was part of the organizing group this year, I’ll be using this post to talk about some highlights from the conference as well as lessons that we learned as organizers. Britt gave a talk about the opportunities around introducing free software to scientists. He is a great speaker, so the talk was full of the usual Britt humor, and it was really interesting to get a peek into the life of a scientist. Britt himself uses free software as much as he can and has started to make others at his school use it as well. Two professors gave a really interesting talk about how we might get more students involved in free software. Key: you appeal to the professors. They gave some really interesting insights into how professors create their curriculum, and what kind of incentives they have. While free software tools for graphic design exist, it’s not exactly an easy transition from Adobe products to apps like GIMP and Inkscape for someone who has been using Adobe their whole professional life. In his two talks, Ryan talked about some of the challenges that designers face with the current free software tools available, and he talked about how his business (FreeHive) is a model for how you can use open source tools for design. He also had a really inspirational message, where he said that free software shouldn’t try to achieve product parity with proprietary software, but that it should instead innovate and provide something that the proprietary software doesn’t. 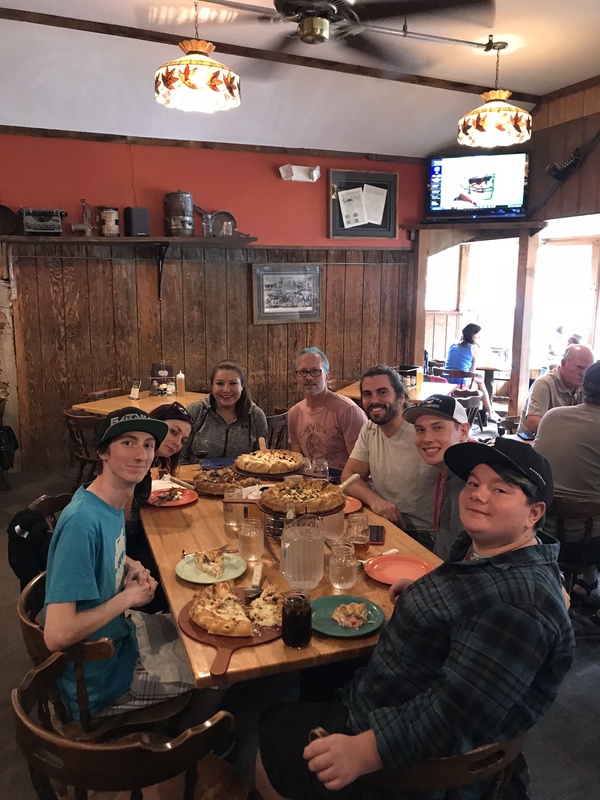 Several students from a nearby college attended LAS GNOME this year. We originally did not have enough space for lightning talks, but we ended up making some time for them and it was great to see the students use the opportunity to speak. There were some really interesting lightning talks, such as one about keyboards! At least one of the students has decided to keep contributing to GNOME on the Engagement team (Mac Grove), and he is interested in getting involved in other ways within GNOME in the future. 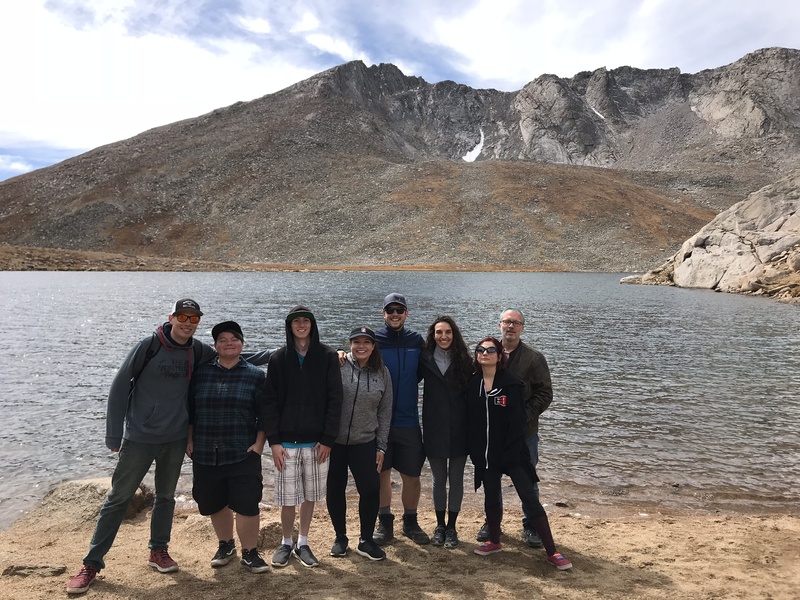 It would be great to get more students to attend LAS in the future! Private Internet Access kindly sponsored a Women’s Dinner at LAS this year. We went to a rooftop restaurant in Denver and socialized over drinks and some great shareable plates. 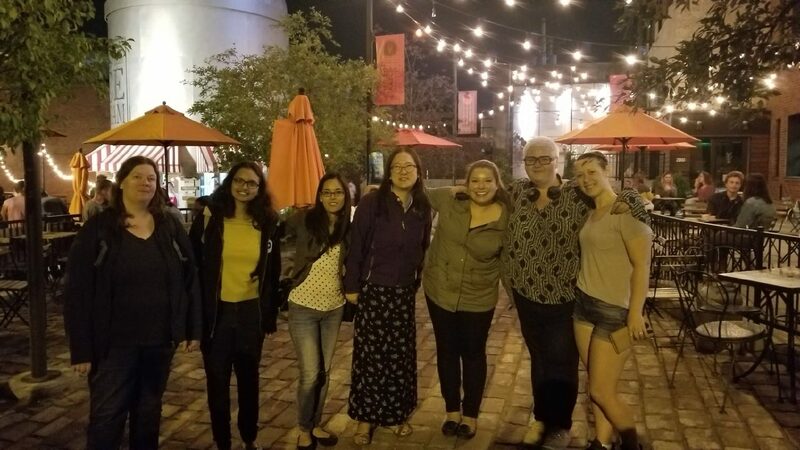 It was a really fun time, and it’s always great to connect with other women in free software. As an added bonus, we went to an ice cream shop next to the restaurant that had a line around the corner most of the night. I had the best ice cream I’ve had in a really long time — I think it was called the space jam or something. It was delicious. Our keynote speaker, Audrey Eschright, gave a great workshop around inclusive writing and interactions. We learned things to look out for in our writing that can make people feel uncomfortable, or are discriminatory, and I found ways that I’d like to improve my general communication. For example, I’d like to get better about asking people about their pronouns, and asking questions that leave out gender as much as possible. 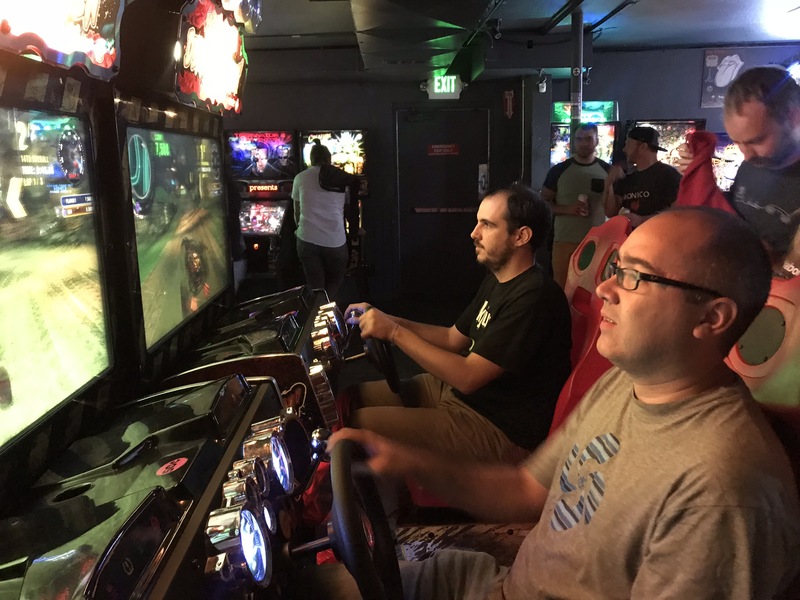 One of the benefits of hosting this year’s conference in Denver is that we were able to hang out with the great folk of System 76. 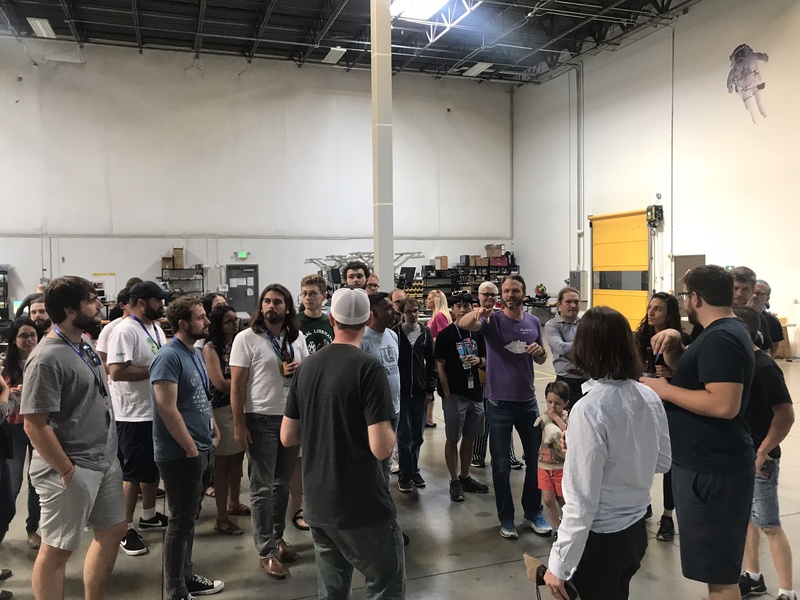 They graciously helped with the conference organization, organized a trivia night, and hosted a social event on the last day of the conference where they included a tour of the new System 76 warehouse! 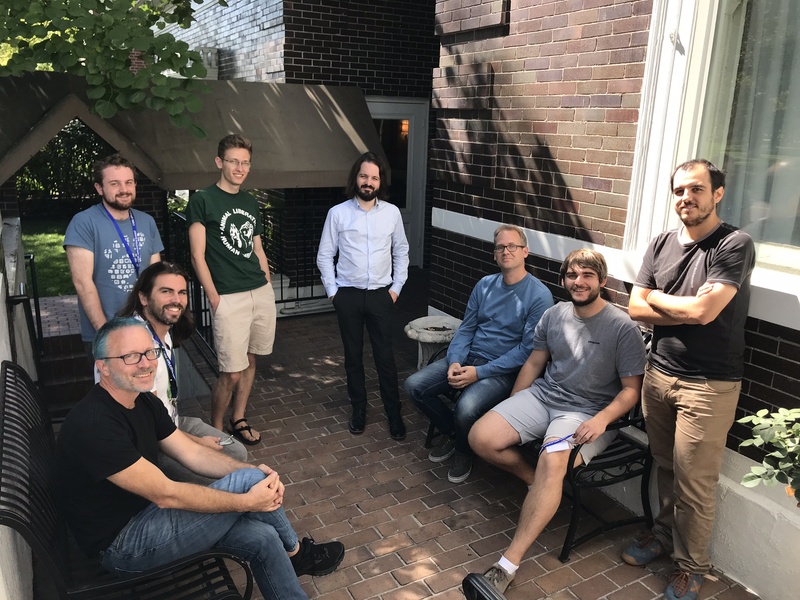 Four members from the KDE community attended LAS this year, including a board member, Aleix Pol. It was really nice to meet more members from KDE, and they participated not only by giving talks, but also by being on the papers committee. 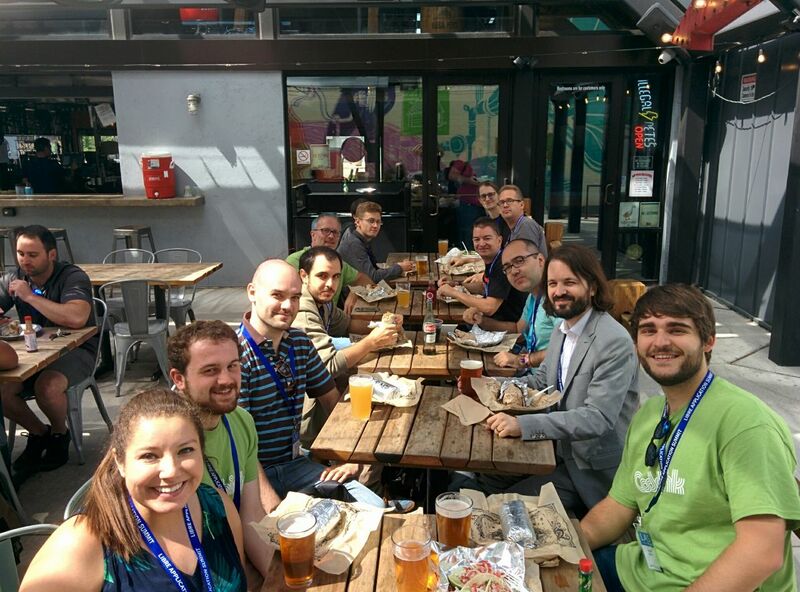 I hope to see more KDE folk at GNOME events in the future, and vice versa. 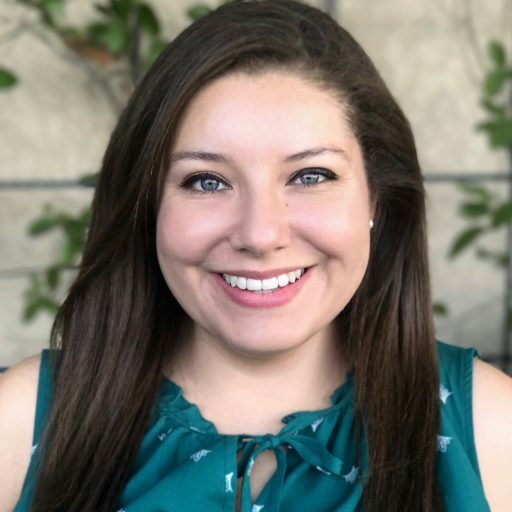 Aleix expressed a strong interest in helping to organize the next LAS and has already been extremely proactive in helping to make that happen — so that’s definitely a great start! Several attendees mentioned that they really enjoyed some of the cross desktop conversations that happened naturally as part of the conference, and that they would like more of it in the future. 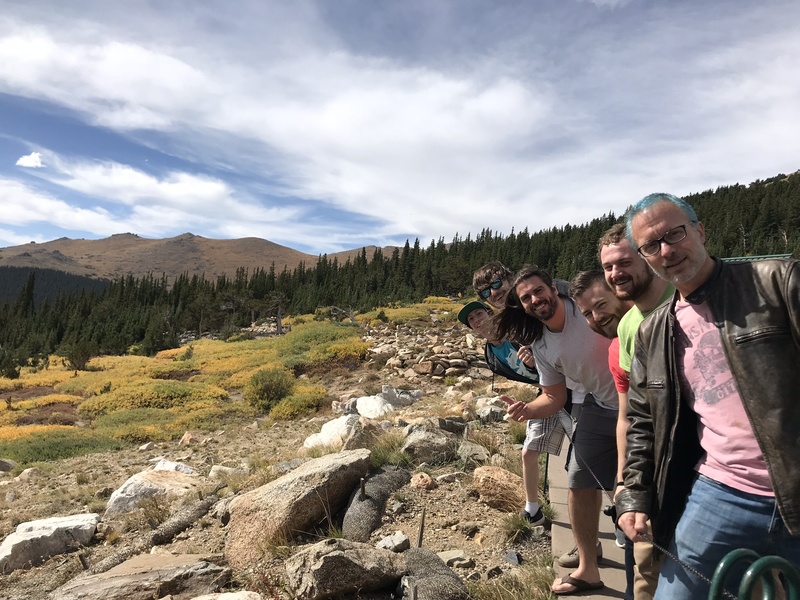 While the notion of having a free desktop summit might not happen right away, we started to discuss how we might try to maintain this part of LAS next year. We also talked about how freedesktop.org might help us do more cross-desktop communication more regularly, since it’s pretty much dead right now. We organized an Engagement BoF at LAS this year and talked mainly about how to create an updated marketing design asset repository and marketing assets for the upcoming year. As a result we created a new project on GitLab to house marketing design assets, and also for people to request new ones. If anyone is interested in getting involved, Caroline is a great person to contact about this. 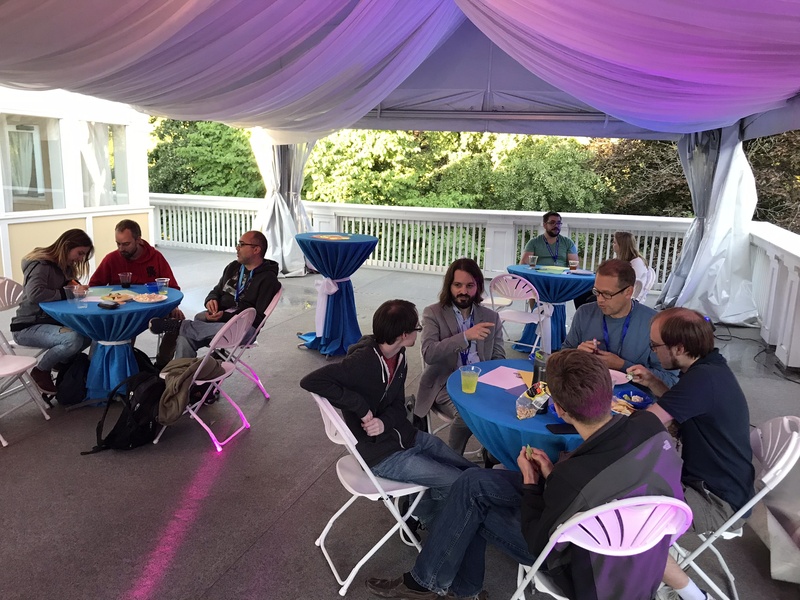 As always, we organized a few social events for attendees to enjoy during the conference. These included a night where we went to grab some pizza to celebrate the latest GNOME release (and had a great birthday cake), and then went to an arcade. 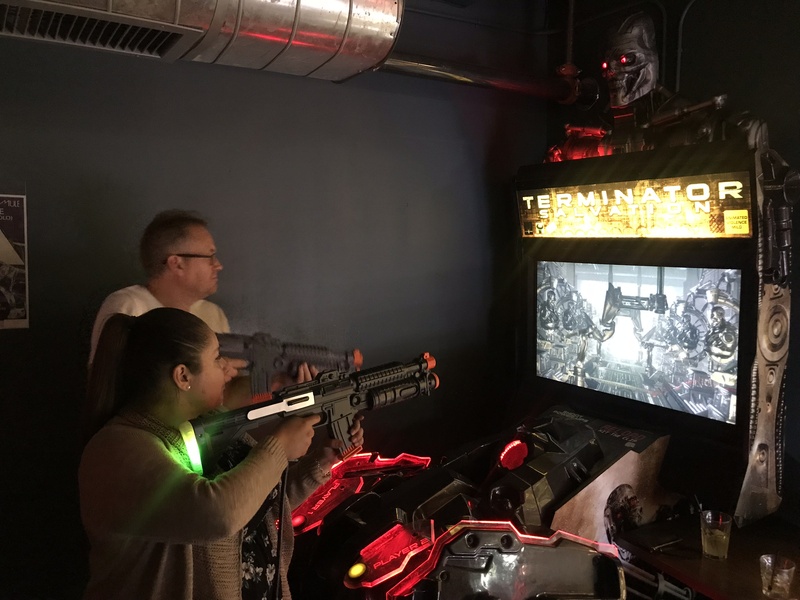 It was a lot of fun trying out my basketball and skeeball skills, as well as shooting aliens with Alex Larsson (who is a great shot btw). 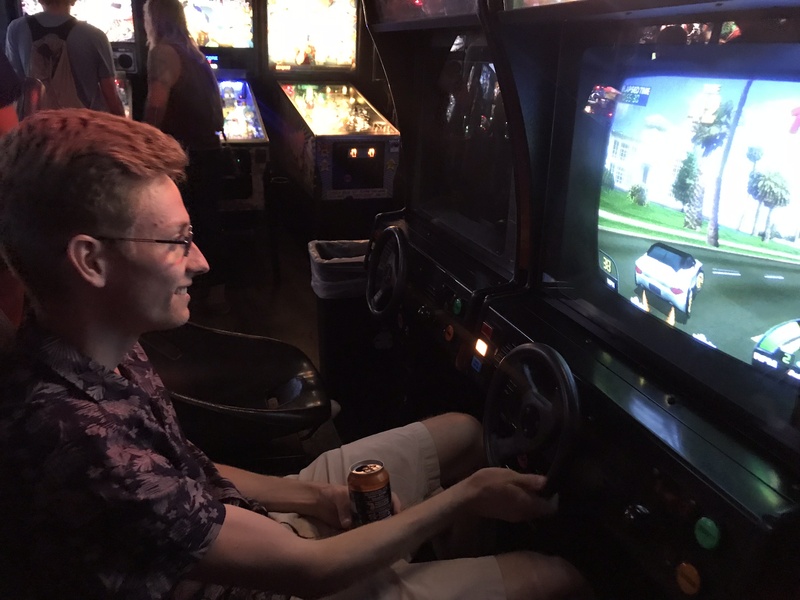 Unfortunately, the arcade was for 21+ only because they served alcohol, so the students weren’t able to join us for that portion of the night. 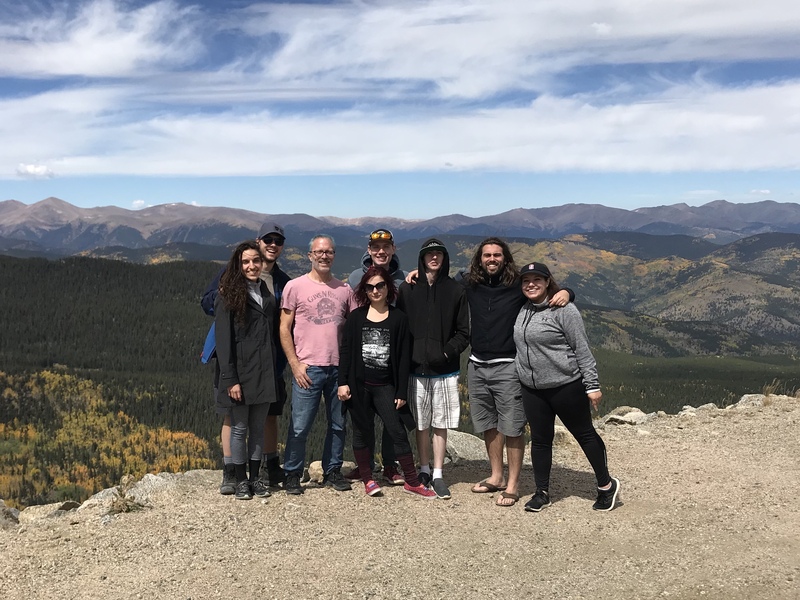 In a last-minute effort to see some of Denver, a student and I helped plan a tour of the greater Denver area because a lot of us were interested in seeing the beautiful fall colors of Colorado. We went to Mt. Evans, which is a beautiful area! 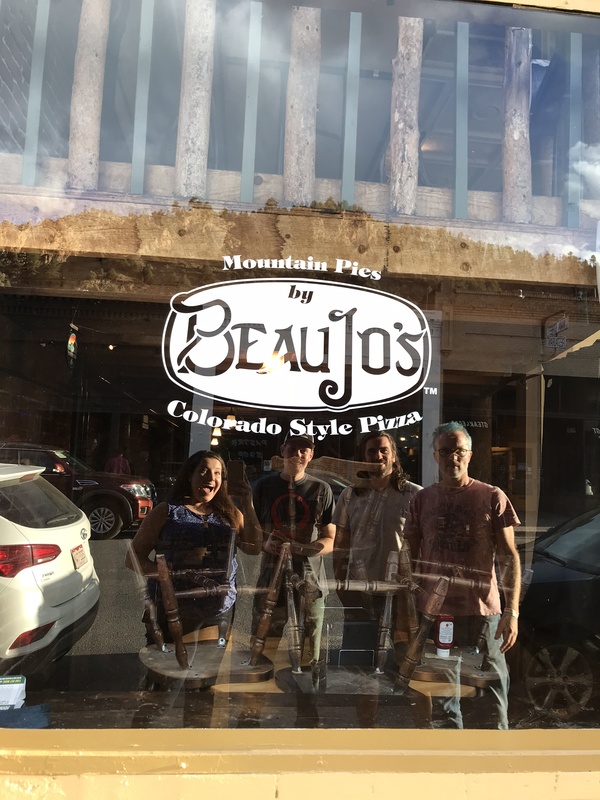 Some people had to leave early, so only a few of us were able to try some delicious pizza at a place called BeauJo’s in Indian Springs, and then go to a hot spring. All in all, it was a fantastic day packed with great sights of the Colorado wilderness, and some quality time with new and old friends alike. Special shout-out to the students who helped plan the activity and show us around! It was great seeing Amisha! Thanks for the fun trivia night, System 76! This is by no means an extensive list, but rather just a few things I’d like to highlight. One thing that we tried this time, thanks to Adam Jones’ suggestion, is Live Tweeting the talks. Since it was a spur-of-the-moment decision, there were some things to learn from for next time we do it. For example, we should get a stand for the phone so that the person tweeting doesn’t get tired during the 45 min-1 hr talk, and we should also have a battery pack handy for obvious reasons. A really good internet connection should also help make the videos less blurry. Unfortunately, the internet connection wasn’t great at the venue so the Live stream came out with rather poor quality (which makes it hard to read slides, for example). This was the second conference I’ve been involved in organizing that used GitLab (the first was this year’s GUADEC), and it worked quite well! One of the things that I like best about it is that you can easily involve new people in the conference organization because all of the tasks are kept in once central location. In the past, GNOME conference organizers have used things like spreadsheets to keep track of tasks, and it is much less easy to coordinate tasks with a group and get new people involved. Based on my experience at GUADEC this year, one of the first things that I checked out once at the venue is that there were gender-neutral bathrooms. Unfortunately, these were located upstairs, in an area where people with accessibility needs would be unable to use. It’s important that conference organizers try to work with the venue beforehand to see which bathrooms are gender neutral (or which ones can be converted during the event), so that this can be announced at the beginning of each conference. Another thing that is important is for conference organizers to keep in mind that there will most likely be people attending who have some sort of food allergy. This means that organizers should make sure to have vegan and gluten free options at a minimum, but preferably they should work with the caterers (if applicable) to know if there are other common allergens in the food (like nuts, shellfish, etc). 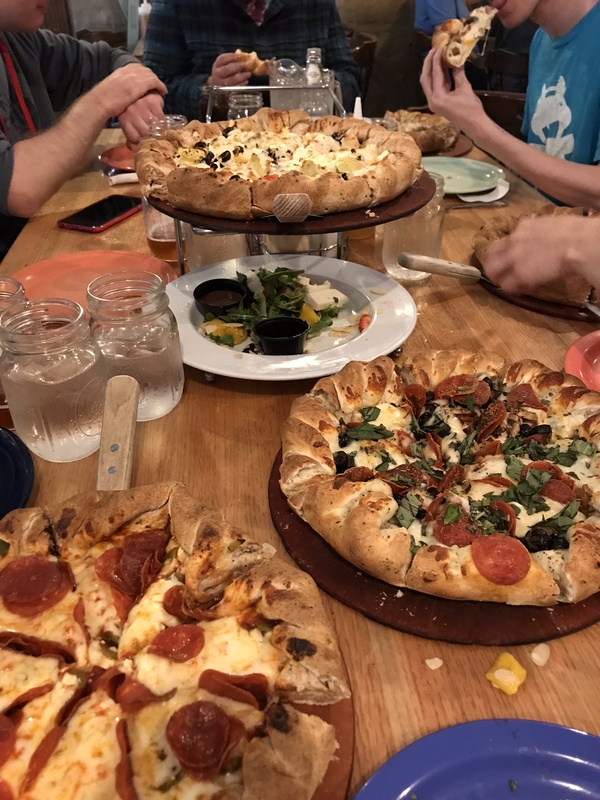 For conferences where food is not provided, organizers should put together a list of restaurants where you might find gluten-free and vegan options. Since LAS is a pretty new conference (this was its second iteration), and it’s one that aims to include communities outside of GNOME, it is still defining its identity and honing its target audience. Partly due to organization timeline issues, there was a limited amount of speakers this year and the topics tended to be for platform developers, rather than application developers. Also, while Flatpak was a big focus, it was not the exclusive app distribution technology showcased. In the really early stages of the conference, back in 2015/16, we had planned on having the focus be on Flatpak and getting people to start using it. In future iterations of the conference, we need to better define LAS’ identity, and figure out how to include others in this space so that we can collaborate more instead of compete. 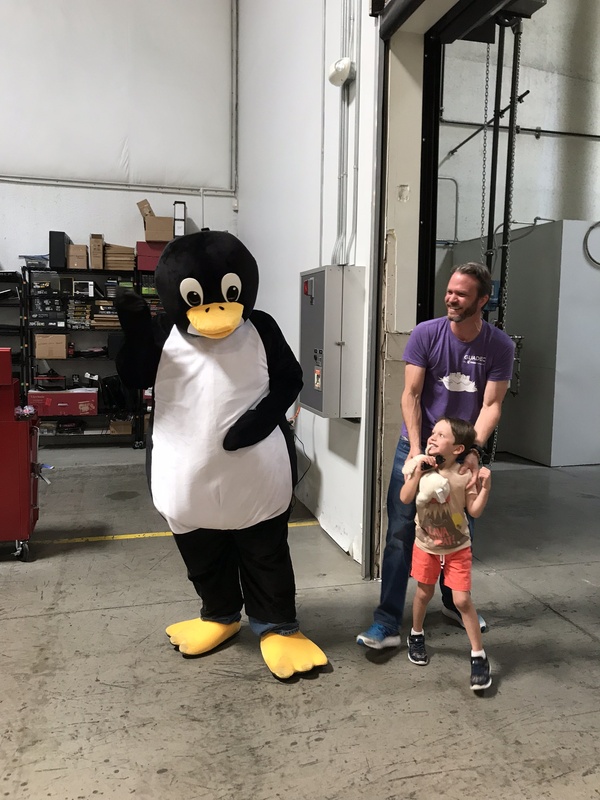 If The Year of The Linux Desktop is ever going to exist, we need more collaboration and less competition among ourselves in strategic areas where we can all benefit. I want to give a huge shout out to Britt and Caroline! They joined the Engagement team this year and have done an amazing job of helping with events and conferences in a variety of manners. Britt has become the ever-enthusiastic doer of all tasks, while Caroline is a very talented graphic designer, and has helped create material for many GNOME activities since she joined. For LAS, she created the brand identity and all of our banners and materials. Both are simply awesome. Thank you so much for everything you’ve done so far, Caroline and Britt! I’m long overdue for a series about my activities representing the GNOME Foundation at conferences and events within the past year. I’ll start off with my time at GNOME.Asia. I’ve attended two GNOME.Asia conferences so far, and this year’s conference was a different format from last year’s since it was co-hosted with COSCUP (Conference for Open Source Coders Users and Promoters), and OpenSUSE.Asia. The conference was held in Taipei City, Taiwan, and I was able to attend and speak about the new things happening within the GNOME Foundation this year, such as the Foundation’s expansion plans and the positions we are hiring for. 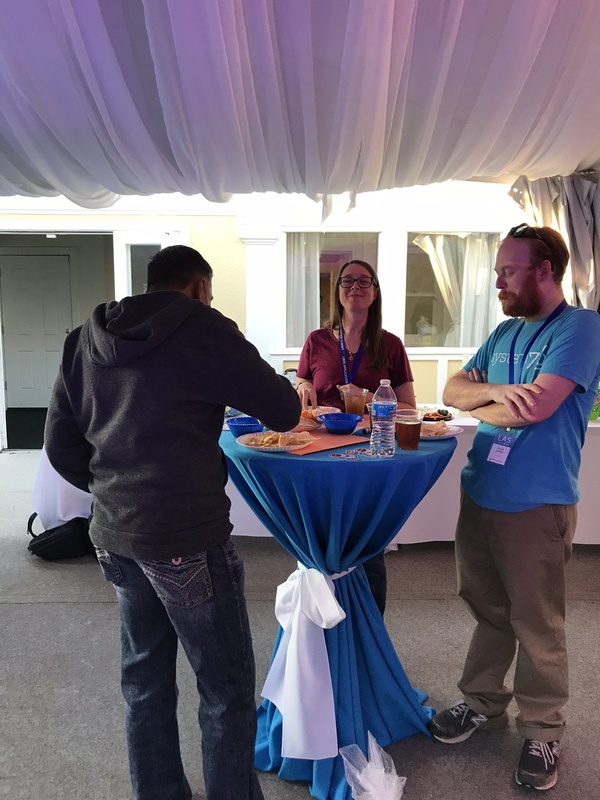 In this blog post, I’d like to share a little more about the highlights of the conference and some of the key takeaways I had from it. In the months proceeding GNOME.Asia this year, I joined the GNOME.Asia committee (via mailing list and IRC), in order to help this year’s organizers have a direct line to the Board and to the global Engagement team. It was great to meet some of the members from the GNOME.Asia committee in person, and to see some of the ones I already knew! 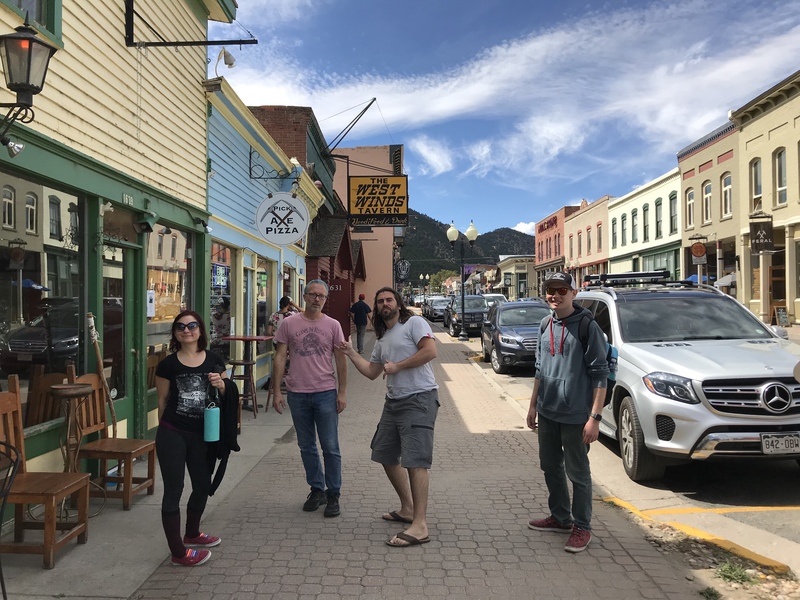 One of the great things that resulted from co-hosting the event, was spending time with many OpenSUSE community members, including some of the OpenSUSE Board of Directors. 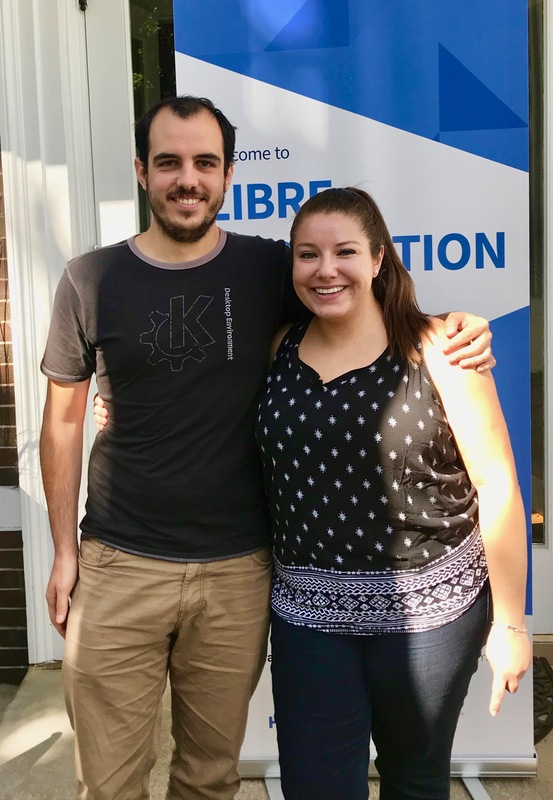 I was able to chat with Ana María and Simon about how their Board is involved in allocating funds, and learning more about the type of things that their Board handles. One of my takeaways is that OpenSUSE tends to place a lot of trust in their community, so credible requests for marketing funds are generally granted. This seems to be working well for them. While I think that the GNOME community has made some great strides recently towards its marketing activities, for example with providing a budget for things like GNOME events, there’s room for improvement. One of the things I’d like to help do in the upcoming months is to make it easier for people to know about and access the marketing and events budget the GNOME has. I think that the future Program Coordinator we are hiring for will be a huge help here as well. A handful of GNOME contributors from outside of Asia flew in once again this year, which I think was really important. Typically, GNOME.Asia attracts a lot of users (or potential users), and promoters. While this is great, it would be awesome to also get more newcomers interested in contributing to other GNOME project teams. Having core contributors from various projects within GNOME attend GNOME.Asia helps attendees of the conference meet people they will be interfacing with if and when they join the global GNOME community. Kat and I gave a keynote speech together where we talked about the importance of free software, about GNOME, and about how to join our community. As a result, I had some really good bonding time with her over writing the keynote speech, and later once in Taipei, attending midnight Board calls. 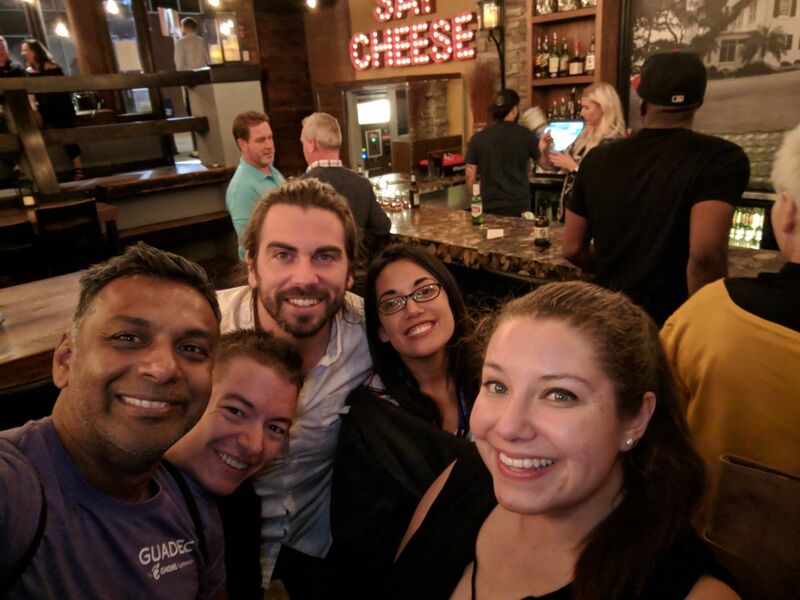 We have a lot in common around wanting to help improve events at GNOME and strengthen ties with community members all around the world. Kat is working on some great initiatives to help standardize the conference bidding process and to help make it easier for interested people to organize GNOME conferences. Max and the local organizers put together a great tour of Taipei, where they organized a bus to take us to the national museum, an amazing dumpling lunch, and Taipei 101 (one of the world’s tallest buildings). Unfortunately, there was limited space on the bus, so not everyone interested was able to join. However, this made the trip more intimate and allowed the participants to get to know each other better. Conferences that include some kind of touring activity have a level of thoughtfulness and intimacy that really makes participating in them special — not only because you get to become more familiar with the people that surround you, but also with the places and culture that surrounds you. I’m really glad that our conferences tend to have this aspect! Group shot on the tour day in front of the National Palace Museum. The closing ceremony included highlights from all three communities: GNOME, OpenSUSE, and COSCUP. We really need to get ourselves some GNOME Beers… these OpenSUSE ones were awesome! Hanging out at the OpenSUSE booth and learning from their crazy cool marketing efforts, and of course, their awesome community! Group shot of the attending OpenSUSE and GNOME boards. From left to right: Simon Lees, Ekaterina Gerasimova, Nuritzi Sanchez, and Ana María Martínez Gómez. The coolest release day shoes you’ll ever see. These are the product of Iwan S. Tahari’s company, which designs awesome shoes like this with Inkscape and other free software tools. It was great meeting the Girls Who Code Taipei group! Iwan Tahari showcasing some of the shoes he’s designed using Inkscape and other free software. Another view of Taipei 101, one of the world’s tallest buildings. It was great to meet (and see again) some of the awesome women in free software. While I really enjoyed meeting members outside of the GNOME community, a trade-off is that there seemed to be fewer people attending GNOME-related talks. The range seemed to be somewhere between 10 – 60 people at any given talk, even for keynotes. In contrast, last year’s conference seemed to be attract audiences of about 50 – 200 for any given talk. In the future, it may be nice to organize some BoFs along with members from the communities that we co-host with as it may encourage us all to cross-pollinate more during talks and work with other community members in general. We had a GNOME BoF this year that centered around organizing GNOME.Asia and fostering a community in Asia. Unfortunately, while I was physically present, my jet lag hit me really badly and I was unable to really participate. The structure of this BoF was different than others I’ve attended since it was announced as a general GNOME BoF. Typically, BoFs I’ve attended have been centered around various topics of interest, such as “Flatpak,” “Engagement,” “Docs & Translations,” etc. The other difference was that each community’s BoF offered participants dinner (e.g. OpenSUSE provided sushi and GNOME provided pizza), since it was late. This drew people to participate in BoFs after the conference ended for the day. It would be great to have more planned sprints and BoFs that are similar to the ones at GUADEC. This could encourage new contributors to core areas of GNOME, since newcomers can get involved. If this part of the conference is planned for, GNOME.Asia might end up getting longer. Right now it’s a weekend event with the next day being an optional tour, but if we move to a new structure that includes BoFs, it could perhaps be 2 days of talks and at least 1 day for BoFs — or perhaps there could be at least one half day of BoFs to start off. Unfortunately, there weren’t any newcomers workshops this year, but they have been great to have in the past and I hope that we can hold them in upcoming years. GNOME.Asia tends to attract a lot of students and newcomers, so having lots of information about internships and how to get involved is something we should absolutely do. Taipei was a great place to host the conference, and Max and the local team did an excellent job! During the conference, Max made an announcement that he is stepping down from being the chair of the GNOME.Asia. For all of you who know and love Max, don’t worry — he isn’t disappearing, but he will join in a more advisory capacity like Emily has. Max has so much experience and is great at representing GNOME in Asia, so while it’s sad that he won’t be as involved, it is great news that he will still be around! Ok, that’s it for my GNOME.Asia post. Next up: LAS GNOME 2018. While I’ve been to Germany several times before, I’d never been to Berlin. Naturally, I was ecstatic, especially when I found out that my friend Tom would be there at the same time for a QT conference. I wasn’t thrilled about the QT part, but more so just about Tom, because he’s awesome. Lodging: If you want a quiet stay in a cute part of town, I recommend the Prenzlauer Berg. It’s walking distance to Alexanderplatz (where the big tower is), and has lots of nice coffee shops and restaurants. Note: I don’t love the grunge style that characterizes other parts of Berlin, so this part of town appeals to my scandinavian furniture / hipster preferences. I highly recommend the apartment I stayed in and you can see photos of that below. Mexican food: As a Mexican American Californian, I know what Mexican food is. Sadly, most of Europe does not. EXCEPT BERLIN!! When someone suggested we try Mexican food in Berlin, I was really worried that I would find the fake stuff I’ve seen anywhere else in Europe (any place that does not know what carne asada is = fake). However, I was pleasantly surprised. The place we went to eat seemed pretty legit. Apparently, lots of Californians have moved to Berlin and have started burrito and Mexican food restaurants. Interesting, and great. So, if you’re in Berlin and have a craving for Mexican food, chances are you’ll be able to find some decent stuff. Beware wasps: If you’re allergic, make sure you keep an eye out for them. A member of our party got stung while eating currywurst near Alexanderplatz. Although I mainly had to work during this trip (first during the GNOME Foundation hackfest and then to prepare my keynote speech for GNOME.Asia), I did get a chance to see part of the city. Unfortunately, I didn’t see as much as I wanted to, but I got a general feel for Berlin, and am already looking forward to the next time I’m there. I stayed in a lovely Airbnb in Prenzlauer Berg, near Alexanderplatz (~15 min walk), and I would definitely love staying there again next time I’m in town. It was modern, newly renovated, had a beautiful garden, and was on the ground floor so I didn’t have to lug my huge suitcase up the stairs. The hosts went out of their way to make me feel comfortable and included many thoughtful details to make my stay great (like a map of places they recommended in the area, and slippers). What I loved about that neighborhood is that it felt really quiet, clean, and safe. There were many young parents walking around with strollers, and older people out for leisurely strolls. I felt really comfortable walking around during the day and even in the evening. 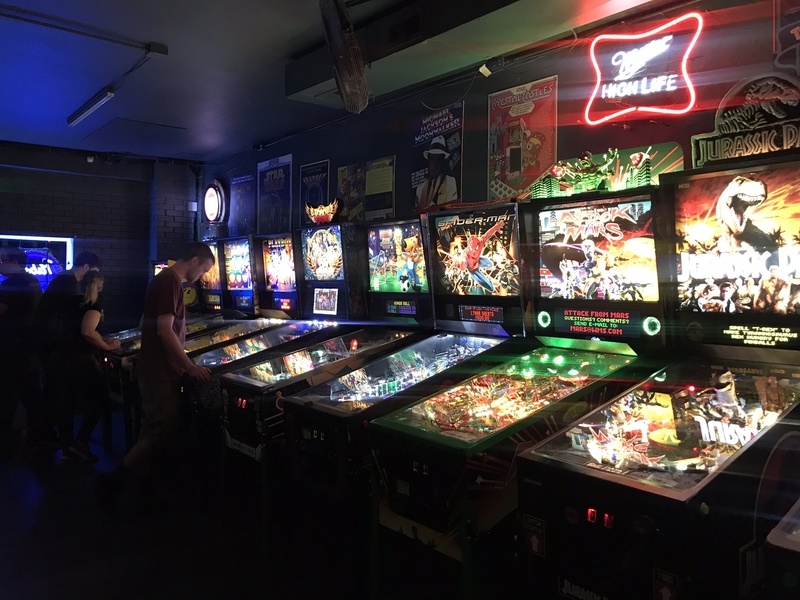 If you’re looking for more of a party scene, or place with lots of bars, this probably isn’t the right neighborhood for you. I didn’t get to see much of Berlin, but I did venture over to Alexanderplatz and took some photos along the way. As mentioned above, one of the reasons I was especially excited about being in Berlin is that my friend Tom was going to be there too. He claims that Berlin is the best city in the world, and I was hoping that he would help me see it in the magical light that he sees it. Since Tom is so nice and awesome, it was easy to have fun. We went exploring one night, and found a Google Pixel exhibit there as part of the Festival of Lights. In typical Tom fashion, we befriended the people running the exhibit, and took many photos. You can see our group selfie below followed by our amazing gif dance. I know, you’re now jealous of how cool Tom and I are. Sorry. This restaurant was a couple of blocks away from my Airbnb and was very cozy. I had some vegetarian tikka masaala while siting on a coach and practicing my speech. The staff was really friendly, and the environment was pretty hipster (which we already established is something I love). This became my basecamp. They have good food, espresso drinks, green juices, and lots of couches and outlets to plug in your computer. Their wifi is fast and reliable, too. I highly recommend this place if you’re in the area and need to study, work, or meet a friend for brunch or coffee. In fact, I met these Italian-in-Berlin friends over brunch here and it was excellent. This year was my first time at GNOME.Asia, and it just so happened to be the conference’s 10th year celebration. I feel very lucky to have been to the GNOME Foundation’s 20th birthday party at GUADEC, and then this outstanding celebration at GNOME.Asia. I want to thank the conference organizers and volunteers for their hard work in hosting this event and for the many thoughtful touches they included to make this conference truly special. I also want to thank them for inviting me to give a keynote speech — I feel very honored to have been given such an opportunity. It was so cool to see how the organizing team included traditional Chinese [fire] dancers in the opening ceremony to help make the conference feel extra special and give it a local flavor. A few minutes after the welcome speeches, I was invited up on stage to give my first-ever keynote speech in front of about 300 people called “The future of GNOME is You.” In it, I encouraged newcomers to join GNOME by telling them more about GNOME’s history, the people and organizations that are part of it, my own story in becoming a member, and the ways that we’ve tried to make it easy for more people to contribute. At the end of my speech, I took a speaker selfie to document the event. During the break following my speech, a few students came up to me interested in learning more about the opportunities that I had spoken about. I was especially excited that a few women came up to me asking about ways I’d mentioned they could contribute. There was also a lot of interest from students about Google Summer of Code. In the future, we may want to prepare some brochures with information on that, or provide better ways for students to connect with people who have participated in the program before. This gave me the opportunity of connecting with them and following up later. For example, I later posted about newcomers events that were happening at the conference, such as Kat’s workshop on the second day, and a few of the people I connected to ended up joining as a result. Win! One of the best things about GNOME is that we know how to have fun! This conference was no exception. The first night, we had hot pot. I learned that Szechuan peppers were not spicy in a hot sense, but rather spicy in a spice sense. And they numb your mouth. Needless to say, I discovered that I’m not a fan of the pepper. But I really loved the hot pot experience!! The next night was the 20th birthday party event for GNOME, and the organizing team rented a boat for us. We were able to enjoy the city’s lights in style. Last but not least, we enjoyed a great day of touring Chongqing on our last day there. We split up into smaller groups and made our way through a Chinese market, then hiked up a mountain to see the difference between old Chongqing and new Chongqing, and finally had dinner at a restaurant that served a special spring chicken soup! GNOME.Asia in Chongqing was absolutely phenomenal, and I’m sure everyone who attended it will remember it forever more. Thank you again to all of those who made it happen! Here are some key takeaways from the conference! Since a lot of people who attend GNOME.Asia are not regular contributors to GNOME, it is important that we have newcomers events to help them begin contributing. After the first day, there was a lot of interest in the areas of coding and translations. Kat put on a great workshop to help people get started with contributions; however, the workshop was planned while other speeches were happening and it was not widely announced. In the future, it would be great to see more of a focus on newcomers events at GNOME.Asia. Also, it would be great to make sure that some of the translation team attend, especially some of the language maintainers for the area where GNOME.Asia will be held. From what I understand, GNOME.Asia is a shorter conference than GUADEC, and primarily held over a weekend. This means that the schedule has to be largely compressed. That being the case, I think it’s still important to try to have some time for BoFs so that it can evolve from just being a conference for newcomers, to one that brings more regular contributors to the table. It would be great to see GNOME.Asia turn into a place for GNOME users and contributors, just like GUADEC is, and in order for this to happen, we need to designate some time for BoFs so people can get some work done. Having BoFs will help with global integration, and I see it as something crucial to the future of GNOME. GNOME is people. In order to form lasting relationships that carry on into the online / virtual world, we need to have fun when we are together in person. I think that this is one of GNOME’s strengths, and certainly something that the GNOME.Asia organizing team did really well this year! Establishing lasting communication channels is crucial. This point seems obvious, but isn’t. We can’t be rigid in our communication channels and expect everyone to join IRC, or even Telegram. In China, for example, all of that is blocked. We need to have both global channels (IRC), and local channels (WeChat), so that people can join and be engaged at both local and global levels. At GNOME.Asia this year, many of us connected first with people through WeChat and then got them to join the global channels over the next few weeks. As a result, the global engagement team has already begun to coordinate more with some of the event planners of this year’s GNOME.Asia. I’m personally looking forward to collaborating more with the GNOME.Asia team and helping to expand our activity globally! First of all, thank you to Max Huang, Emily Chen, and Wen Qixiang for providing the opportunity for me to keynote at GNOME.Asia! Matthias Clasen, Julian Sparber, and Tobias Bernard also helped with their moral support before and during my speech. Julian and Tobias let me practice with them, and Matthias cheered me on before, during, and after my speech. Thank you!!! I made many new friends at GNOME.Asia, but I wanted to give a special thank you to Anna for giving me my new Chinese name: 睿茜. It’s a name that sounds like part of my name, “ritzi,” and means something along the lines of “wise/clever princess” 🙂 I also want to thank Heather for taking such good care of us while we were there! To Kat, thank you for braving the store with me when I wasn’t feeling well! It really helped, and I deeply appreciate it. I did it. I finally created a blog. Oh, and lucky you. You’re my first reader! Actually, I have no way of guaranteeing that you’re my first reader. But, I still want you to feel special. Because you are. “Ok, so what’s the point of this blog?,” you ask? It’s basically meant to serve as a medium for me to share my journey with you. Pretty standard stuff. Unfortunately, I’ve never been very good at journaling, so I’m pretty sure that my blog posts will be sporadic at best. Sorry in advance. I hope you’ll still find at least some of these blog posts interesting and useful.